In this video we will discuss the significance of launchsettings.json file in ASP.NET Core project. You will find this file in the "Properties" folder in the project root folder. The settings in this file are used when we run this ASP.NET core project either from Visual Studio or by using .NET Core CLI. This file is only used on local development machine. We do not need it for publishing our asp.net core application. 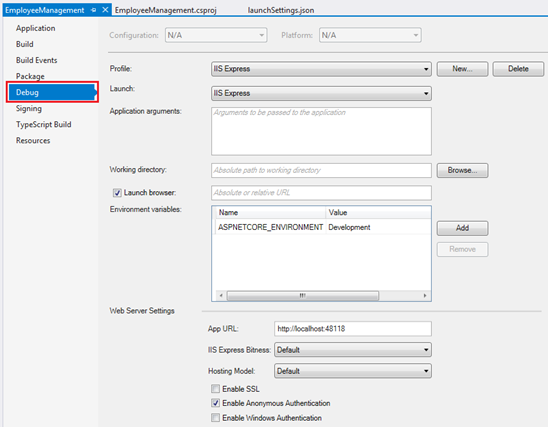 If there are certain settings that you want your asp.net core application to use when you publish and deploy your app, store them in appsettings.json file. We usually store our application configuration settings in this file. We can also have environment specific appsettings.json files. For example, appsettings.Staging.json for the staging environment. In ASP.NET Core, in addition to appsettings.json file, we also have other configuration sources like Environment variables, User Secrets, Command Line Arguments and even our own custom configuration source. More on these different configuration sources and appsettings.json file in our next video. 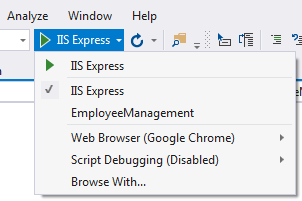 When we run the project from Visual Studio by pressing CTRL + F5 or just F5, by default, the profile with "commandName": "IISExpress" is used. On the other hand, if we run the project using .NET Core CLI (dotnet run), the profile with the "commandName": "Project" is used. The value of the commandName property can be any one of the following. This value along with the value of AspNetCoreHostingModel element in the project file, specifies the internal and external web server (reverse proxy server) to launch. You can change the settings in launchSettings.json file by directly editing the file or we can also change the settings using the Graphical User Interface (GUI) provided by Visual Studio. Right click on the project name in Solution Explorer in Visual Studio and select "Properties" from the context menu. Using the GUI we can change the settings in launchSettings.json file. Notice, the Environment Variable "ASPNETCORE_ENVIRONMENT" is set to "Development". We can change this value to Staging or Production depending on whether we are running this project in Staging or Production environment. We can also add new environment Variables. These environment variables are available throughout our asp.net core application and we can include code that conditionally executes depending on the value of these environment variables. Developer Exception Page is only displayed if the environment is Development. We will discuss environment variables and developer exception page in detail in our upcoming videos.